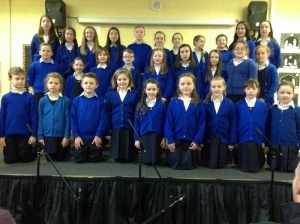 All classes from St. Aidan’s took part in our recent fundraising Christmas concert . 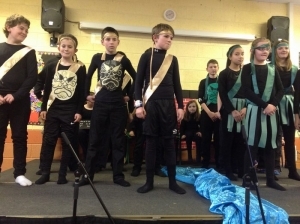 Each class performed at a matinee and evening show. Due to space limitation the concert was held over two days, on Wed 16th and Thurs 17th December. Each show opened with a selection of songs from St. Aidan’s school choir under the direction of Miss. Lee. This was followed by a dance a routine, co-ordinated by The Redmond School of Dance and Ms Mc Nicholas. 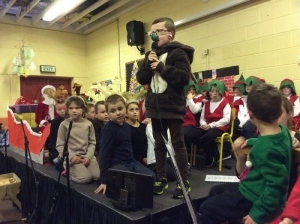 On Wednesday Ms Lee’s Junior and Senior Infants performed Whoops –a –Daisy Angel – the story of a little angel who is a little messy and forgetful but who has a heart of gold! She normally gets all the boring jobs but one day gets a VERY important job to do and manages to do it perfectly. Mrs.Mooney’s 1st Class performance was based on Clemant C. Moore’s ‘Twas the Night before Christmas. 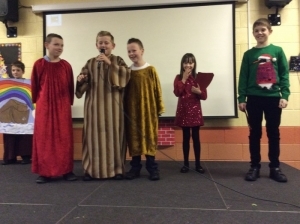 They finished with some popular Christmas Carols. 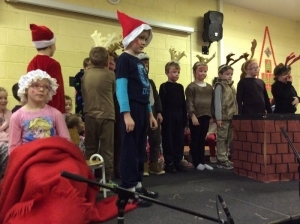 Ms Mc Neela’s Senior Infants and 1st Class performed Ralph the Reinder. Poor old Rudolph had a terrible cold. Santa needed someone to help guide the sleigh. Enter Ralph the Reindeer, who is eager for work and very willing to help, but at the last minute, we discover Ralph can’t actually fly. We saw how Ralph and Rudolph solved the problem and saved the day! 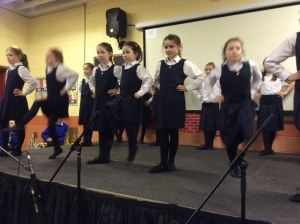 The children in 4th class under the direction of Ms. Tierney, played the roles of some of Jesse’s relations from the Old Testament, danced their version of The Stack of Barley and played a tune on the recorder. 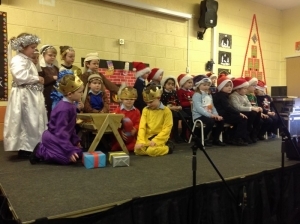 Wednesday’s concert concluded with Miss Nyland’s 2nd Class performing Peace on Earth!- a Christmas musical Nativity. 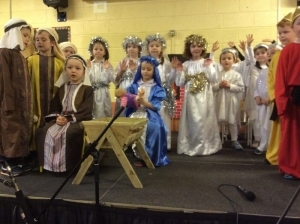 On Thursday Ms McCallion’s Junior Infants presented their version of the events that led up to the birth of Jesus- Nursery Rhyme Nativity! 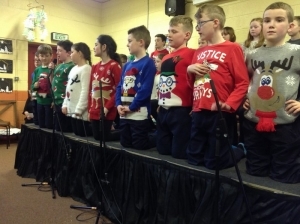 This was followed by Mrs Hickey’s 3rd class playing four tin-whistle tunes – They recited their Christmas Alphabet and sang Silent Night in three languages – English, Irish and German! They finished with two hip-hop dances – Shark Tale and the Santa Claus Rock. 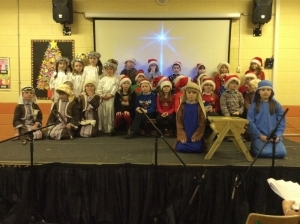 The final concert item was the 5th & 6th class production ‘The Peace Child’ under the direction of Mr.Donnellan and Mrs.Rushe. We all enjoyed the entertaining song, dance and dialogue in this drama which had an underlying message for us all. Thanks to the school staff, members of The Parents Association, Kiltimagh Credit Union (our main sponsor), all sponsors of raffle prizes and all who worked to make this concert a tremendous success.